Business accounting and taxation is designed with a specific focus on helping you to become a professional accountant. The course is designed to give hands-on-expertise in Accounting and Taxation. BAT course program prepares you not just for a job but provides you practical exposer to grow in your career as accounting and taxation professionals. Any undergraduates, graduates, post graduates and working professionals aspiring for a career in Accounting and Taxation are eligible for this short term course. Depending on various training institutes this BAT course will cost you almost Rupees 50000 on an average. It’s a full time training course and normally time duration to complete this accounting and taxation course training is about 3 months. This short term course covers accounting concepts, direct and indirect taxes, different payroll policies, financial statements, IT proficiency and MIS reporting, QuickBooks, SAP modules, knowledge of advance excel, GST model etc. After completing this short term courses you will understand various practical aspects of accounting and able to deals with taxation and other compliances. This will make you an experienced professionals in accounting and taxation. On an average you will get a salary of 3 to 12 lakhs per annum after this short time course. Tally is specifically designed software keeping in mind Indian small traders & dealers. Tally is mostly preferred due to simplicity, easy to operate, less cost involved in implementation & maintenance. This software handles accounting, inventory management, tax management and payroll etc. Any Graduates, working professionals, 12th pass students, pursuing CA and MBA are eligible for pursuing Tally course. Depending on various training institutes this Tally course will cost you almost Rupees 10000 on an average. Normally time duration to complete this Tally course training is about 3 months. This short term course covers Accounting, Billing, Payroll, Inventory, Banking Taxation, Reporting etc. Tally certified professional may work in the entire field like Hospitals, MNC’s, banking and accounting sector. This is a job oriented short term course for those seeking quick employment. It helps you to gain an entry in corporate world through computer accounting. Average salary for tally employees will be 5 to 40 lakhs per annum. Whether you are in Finance, Operations, Sales & Marketing or Planning, you will be in touch with million data points every day. Business analytics course find ways to make sense of all available data regarding any type of business. It uses tools and techniques like data mining, pattern matching, data visualizations and predictive modeling to predict and optimize outcomes and derive value from the data. 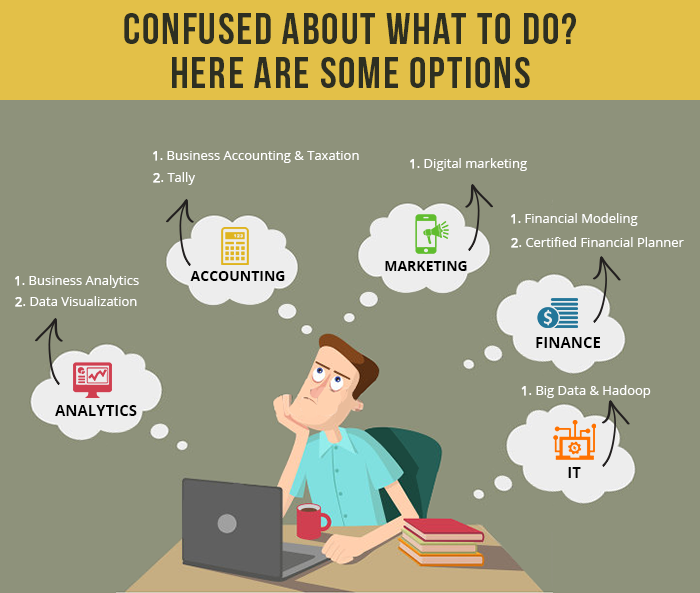 Depending on various training institutes this Business Analytics course will cost you almost Rupees 30000 to 40000 on an average. Normally time duration to complete this Business Analytics course training is about 3 to 5 months. This short term course covers Summarizing data, Linear Regression, Logistic Regression, Decision Tree and Clustering, Time Series Modeling, Market Basket Analysis etc. The use of Business Analytics is widespread across all industries and functions, including Information Technology, Web/E-commerce, Healthcare, Law Enforcement, Banking and Insurance, Biotechnology, Human Resource Management. The average salary for a Business Analyst is Rs 5 to 10 lakhs per annum. Most business intelligence software vendors embed data visualization tools into their products, either developing the visualization technology themselves or sourcing it from companies that specialize in visualization. This Data Visualization course is designed to help you understand and use the important concepts and techniques in Tableau to move from simple to complex visualizations and learn how to combine them in interactive dashboards. The Data Visualization Course is open to anyone who is interested in the visual analysis of data – regardless of technical or analytical background. Depending on various training institutes this Data Visualization course will cost you almost Rupees 15000 to 20000 on an average. Normally time duration to complete this Data Visualization course training is about 1 to 2 months. Good visualizations not only present a visual interpretation of data, but do so by improving comprehension, communication, and decision making. Mainly this short term course covers visualization design methodology, Calculation in tableau, advanced mapping, statistics and forecasting etc. There are wide variety of career opportunities such as, Visualization Designer, Curriculum designer, Data visualization scientist, Analytics Consultant etc. There is no such requirement is needed, you need to know basic computer operations like MS Office, Excel, surfing etc. Depending on various training institutes this Digital Marketing course will cost you almost Rupees 15000 to 50000 on an average. Normally time duration to complete this Digital Marketing course training is about 2 to 3 months. Digital Marketing Course covers many channels namely SEO, Email Marketing, Social Media Marketing, Pay per click and Affiliate Marketing, web analytics, mobile marketing etc. Digital Marketing is here to stay and everyone wants to be a part of its future. After completing digital marketing training you will be responsible for variety of digital marketing job roles such as Digital Marketing Manager, SEO Manager, Content Manager, Mobile Marketing Expert, Web analytics Executive etc. Big data is a term that describes the large amount of data for both structured and unstructured. Big data and Hadoop course can leads you making better decisions and strategic business moves. Hadoop is a software framework for storing and processing Big Data. It is an open-source tool build on java platform and focuses on improved performance in terms of data processing on clusters of commodity hardware. Any Graduate/Post-Graduate, who is aspiring for great job opportunities in Hadoop are eligible to pursue this short term course. If you are looking for the latest technologies to be implemented in your organization, to meet the current & upcoming challenges of data management Big Data and Hadoop course is the best option. Depending on various training institutes this big data and Hadoop course will cost you almost Rupees 20000 to 40000 on an average. Normally time duration to complete this Big Data and Hadoop course training is about 1 to 3 months. This short term course includes hands-on experience in Core Java and good analytical skills to grasp and apply the concepts in Hadoop. Hadoop comprises of multiple concepts and modules like HDFS, Map-Reduce, HBASE, PIG, HIVE, SQOOP and ZOOKEEPER to perform the easy and fast processing of huge data. Hadoop is one of the hottest career options available today for software engineers. There are huge amount of jobs currently for Hadoop developers, Chief data officer, Data analyst, Big Data Engineer, Data Architect etc. Average salary of a Hadoop Professionals are 5 to 30 lakhs per annum. Java is an object-oriented language that enables you to create real-world applications. Java technology based software works almost everywhere, from the smallest devices to super computers! Java being the highly admired language all around the world, gives an opportunity to score high in terms of employment. Java professionals are known to be amongst the highest paid professionals and enjoy the best of benefits. Although there is no such compulsory eligibility criteria required to pursue Java, but then it is preferred that the student should be from the software background and should have knowledge of C++ language. Depending on various training institutes this Java course will cost you almost Rupees 5000 to 15000 on an average. Normally time duration to complete this Java course training is about 3 to 6 months. The major topics covers under this Java syllabus are Java Fundamentals, Architecture, and Significance etc. After getting the proper training in Java your career could start as variety roles such as Java Programmer, Java Web Developer, and Java Webmaster etc. The average Salary for a Java Developer is Rs 4 lakhs per annum. Financial Modeling is one of the most fundamental and widely sought after skills in the finance industry. It is the art of building a model to depict financial statements and investment analysis using MS Excel. By the end of this short term course, you can build models that are robust and provide dynamic projections to analyze a company from multiple standpoints: operations, investment, financing and valuation. There is no such compulsory eligibility criteria is required to pursue this short term course but if you have hands-on experience with Excel and a brief idea about Finance, Balance Sheets and Cash Flow Models it will be great. Depending on various training institutes Financial Modeling course will cost you almost Rupees 30000 to 50000 on an average. Normally time duration to complete this Financial Modeling training is about 2 to 3 months. Financial Modeling helps to do the task of building a model depicting financial statements/business model, which helps in decision making. There are variety of career benefits and opportunities available after completing this short term course. Commercial Banks use Financial Modeling for disbursing loans for the projects, Project Management uses it for performance tracking of on-going projects. Average salary after Financial Modeling course would be 5 to 15 lakhs per annum. Certified Financial Planner certification is the most respected global certification for those individuals who meet the education, examination, experience and ethics requirements. The international Certified Financial Planner (CFP) certification is awarded by the FPSB India and currently CFP certification is available in Kolkata, Mumbai, Hyderabad, Bangalore, Pune and New Delhi. Minimum eligibility criteria for Certified Financial Planner is passing of 12th Class. Depending on various training institutes Certified Financial Planning course will cost you almost Rupees 40000 to 50000 on an average. Average time duration to complete the CFP Course is almost 6 months. This short term course comprises of various planning methodologies such as Financial Planning, Insurance Planning, Retirement Planning, Investment Planning, Tax planning, Estate planning etc. Financial planners discuss many personal finance topics with their clients, including debt management, savings objectives and strategies, and personal and family budgeting, protection planning through insurance, and retirement accumulation and distribution tactics etc. Average Salary of a Certified Financial Planner is 3.5 Lakhs per annum. So, now you can understand there are various short-term courses available that will give you options to start your career shortly. Don’t waste your valuable time by thinking about exam result or consulting with others for the career. If you choose an area where your strengths lie and match a course, success is not far.